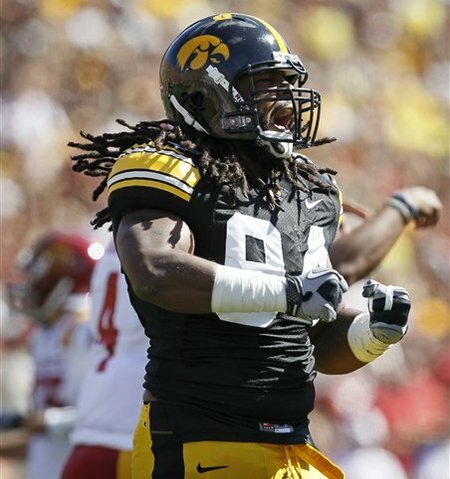 Iowa started strong led by Adrian Clayborn and Iowa's front four. Redemption came at last in the Arizona desert where the first warning bell tolled against a predicted preeminent Iowa football season. Iowa,who started college football in August as the media darling of the Big Ten, reportedly fielded one of the best defenses in the nation. Indeed, Iowa’s front four proved to one of the best quartets in college football. But even they needed help from the linebacker corps and the secondary to contain an assemblage of top-ranked quarterbacks who spread their opposing offenses, often picking apart even Iowa’s well-oiled defense. Unfortunately for the Iowa D, the Hawkeye’s defensive coordinator, Norm Parker, was sidelined for the season in September after undergoing surgery to amputate his right foot, necessitated by complications of diabetes. Furthermore mounting injuries practically decimated the Hawkeye linebacker corps as well as limiting or sidelining other key defensive personnel. The first real chink, however, appeared in Tucson where the No. 24 Arizona Wildcats upset Iowa in an unusual game for the highly vaunted No. 9 Iowa Hawkeyes. In the first five minutes Iowa endured a blocked punt and an interception, sending Arizona up 14-0. Iowa scored a touchdown in the second quarter but Arizona returned the subsequent kickoff for 100 yards and another score—plus two field goals. Arizona was up 27-7 at the half. Scoring another touchdown in the third quarter, Iowa climbed seven points closer. The Hawkeye’s defense had clamped down hard on the Wildcats, holding them scoreless well into the second half. In the fourth quarter another Ricky Stanzi pass added another seven, leaving Iowa trailing only 27-21. At that point Broderick Binns intercepted a Nick Foles pass and returned it 20 yards for a score to break things wide open. But Trent Mussbrucker’s PAT was blocked and the score remained tied at 27-27.